"When I started my blog more than a year ago, I had no idea where it would lead me. I started with a small following, which over the past year grew into thousands of followers and fans! Without my fans, I wouldn't be having so much fun publishing family and parenting tips, my journey to a healthier me, reviews of my favorite products, or fun giveaways. To thank you all, I decided to have this giveaway! I hope you all continue to follow the blog and my ramblings on my social media sites! Special thanks to my co-host, Ef Zin Creations, all of the wonderful bloggers who chose to join me in this giveaway!" 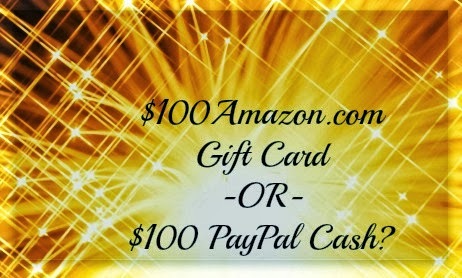 One lucky winner will win his/her choice of either $100 Amazon Gift Card OR $100 PayPal Cash! 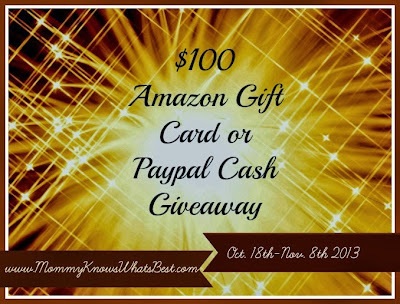 Prize: Choice of a $100 Amazon Gift Card (sent as an e-code) OR $100 PayPal Cash. Disclaimer: Giveaway begins 10/18/13 at 1 am EST and ends 11/8/13 at 11:59 pm EST. This giveaway was blogger sponsored. Mommy Knows What's Best is responsible for prize delivery. One entrant/email per household. One winner will be chosen randomly from Giveaway Tools. Void where prohibited. Choice of prize depends on your country's laws. Winning entry will be verified. The winner has 48 hours to respond to the congratulatory email. If the winner does not respond, a new winner will be randomly chosen by Giveaway Tools. Facebook, Twitter, Pinterest, Instagram, Amazon, and PayPal are in no way affiliated with this giveaway. If you have any questions, please email Marissa at MommyKnowsWhatsBest@gmail.com. I'd use this toward Christmas gifts. I'd buy some books and CD's. Put it towards Christmas gifts for my girls. For my boys clothing,I entered on javajohnz blog. I would add an Amazon.com gift card to my gift card account - I'm saving up for a big screen TV. I would us it to buy some Christmas gifts with! If I win, I would use the money for Christmas gifts. If I win,I will save it for the holidays and spend it on the kids. I would get some more Christmas gifts! I would get some Christmas presents at this point!.. I do need to get a few. I'd use it towards a new pair of boots or a new shirt. I would use it for Christmas presents for my six nieces and nephews (books mainly). I'll use it for presents. I will buy some great food items for Thanksgiving dinner. I will use it to help buy a Kindle! I have lots of gifts on my Amazon wish list that I would buy if I won!